To celebrate the centenary of the women's vote, this year's Winter Concert celebrated 'Women in Music'. 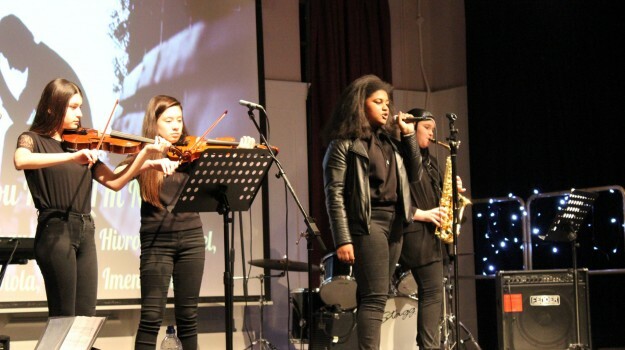 The concert showcased the musical talent and success of our young women. The evening began with the HFS Drama club performing a powerful Maya Angelou poem 'Still I'll Rise', which was poignantly supported by the HFS Choir and their rendition of 'Rise Up'. The evening consisted of many first time performances both in the Big Band and solo. We had an outstanding performance from Year 10's Ruth and Evelyn; both talented singer songwriters, as well as the beautiful arrangements from Ms Connors and the HFS String Club. As ever, the evening's success was due to the hard work of Ms Olise and all the Music peripatetic staff who, as ever, work tirelessly in ensuring the concert is of the highest quality.